In the Bible, the prophet Elijah had such a meal in I Kings 19:5-8. Elijah was on the run from the wicked King Ahab at the time and had just traveled a day’s journey into the wilderness of Israel. He sat down at the end of the day – deathly afraid in his circumstances – and prayed for God to take his life, thinking he had nothing left to live for. As he slept under a tree, God sent an angel with some cakes of bread and water. The angel instructed Elijah to rise up and eat. Elijah did so then went back to sleep. Then something remarkable happened. “The angel of the Lord came back the second time, and touched him, and said, ‘Arise and eat, because the journey is too great for you.’ So he [Elijah] arose, and ate and drank; and he went in the strength of that food forty days and forty nights as far as Horeb, the mountain of God (I Kings 19:7-8). Elijah was on a journey, a mission from God. He could not have completed that journey without something to sustain him, something to keep him going. In his case, it was a supernatural meal that provided energy for 40 days. That’s a miracle meal! I am not aware of any food substance on the grocery store shelves that could provide our bodies with energy for this long. We don’t have access to this type of sustenance, barring an Elijah-like God intervention. And I doubt that the prospects of our next meal, regardless of how good it might be, really serves as the driving force that pushes us to move forward in life. We have to rely on other things to keep us going for the long haul. 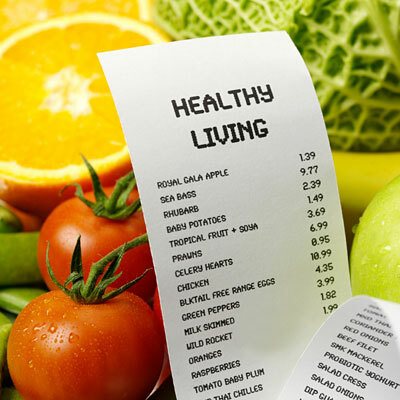 If you’ve read this far you have probably figured out this post is not really about monthly food budgets (if your interested in that, click on the following article for some good tips – Lowering Your Food Budget.) It’s more about answering the question, “What thing in my life sustains me long term?” Each of us will answer this question differently and the answer may change over the various stages of our life. Once we answer it honestly, however, we will know where our priorities lie, and be able to tap into these priorities as a source of energy to move us forward day by day. What helps sustain you long term? Is it your faith? Reaching a goal? Obtaining financial security? Life with your family? Pursuing a dream? Your work? Helping and serving others? What keeps you going day after day?